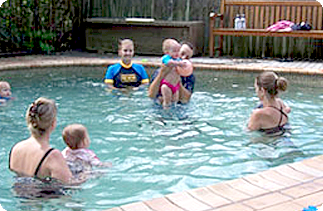 Tanya’s Tadpoles offers private swimming lessons for babies in the convenience of your own home swimming pool. We encourage parents to take to the water with their babies, making it a great family activity, as well as more comfortable and familiar environment for the baby to enjoy the swimming lesson. 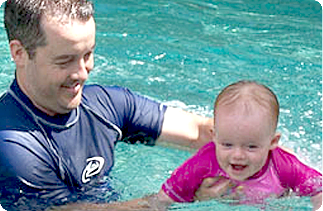 Parent and baby swim classes are offered for children from 5 months in well heated pools. The following is a guide to the skills developed in our babies programme (5-24 months). Each lesson for babies and young children is conducted incorporating songs and games. Enjoyment is a paramount to our classes – we do not wish to traumatise children through forcing them to participate in activities they are not comfortable doing. Therefore the skills listed provide a guide – each child develops physically and emotionally at different rates and will be ready for different skills at different times. The stages described below list developmentally appropriate skills for the age groups when babies or children have had good exposure to the water. Older or more timid/ fearful children who may have had less exposure to the water will need to spend more time completing both the tasks in the younger group list as well as learning some of the skills they are physically able to complete in their age category.